In a time of jihad "against Jews and Crusaders," the Jews of America and Israel find themselves with a powerful albeit unlikely ally: tens of millions of American evangelicals. As the conflict in the Middle East roils and divisions harden, Israel, a nation at war, welcomes this Christian support, whereas the American Jewish establishment--liberal, secular, and Democratic--remains wary. 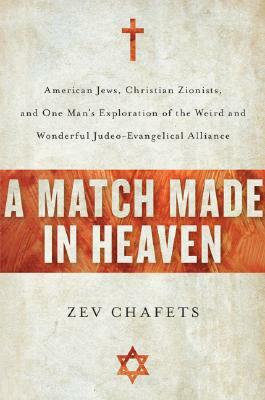 This tension, along with the question of whether the Jews will embrace the evangelicals' offer of partnership before it is too late, is at the heart of Zev Chafets's incisive and compelling new book. Over the course of a year, Chafets, a former New York Daily News columnist and onetime director of the Israeli government press office, travels the world, tracing the improbable confluence of Jews and evangelicals. Along the way, Chafets meets Jerry Falwell and his national championship debate squad, visits Jewish cadets at West Point, heads to Virginia to tour Pat Robertson's university, meets the Pentecostal priest of Wall Street, attends the world's biggest Christian retail show, accompanies the rabbi with the biggest gentile following since Jesus on a road trip, travels the Holy Land with a band of repentant Christian pilgrims, and breaks bread with George W. Bush (and five hundred fellow Jewish Republicans). Although Chafets spins a penetrating, engaging, and often hilarious narrative, A Match Made in Heaven has at its core some very serious questions: How is the relationship between Jews and Christians changing? Why do evangelicals support Israel so strongly? Is their philo-Semitism just a front for their true purpose to convert Jews? Do the evangelicals, as their opponents charge, really want to use the Jews as cannon fodder at the battle of Armageddon? Or are they simply responding to the biblical commandment to love Israel? Finally, is the American Jews' fear of fundamentalist Christianity based on constitutional principle--or social and cultural snobbery and political partisanship? Equal parts history, comedy, travelogue, and political tract, A Match Made in Heaven is a smart and adventurous trip along a rapidly changing religious and political border.